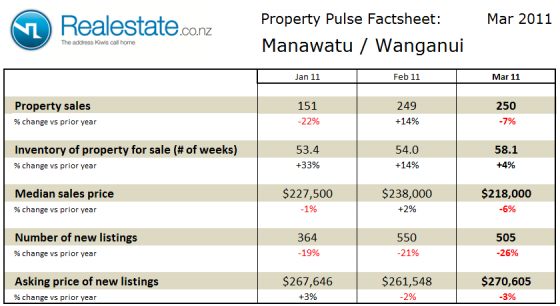 The Manawatu / Wanganui region property pulse factsheet for July 2012 is published using data from Realestate.co.nz and REINZ (Real Estate Institute of NZ). Property sales in the Manawatu and Wanganui region at 293 in the month rose on a seasonally adjusted basis in July, and was up a significant 24% as compared to a year ago. The inventory of unsold houses on the market rose slightly to 39 weeks, this maintains the level of unsold houses on the market below the long-term average of 41 weeks of equivalent sales. Median sales price of properties sold in the Manawatu and Wanganui regions at $225,000 was up 5% as compared to a year ago, and very slightly lower than the figure in June. The asking price expectation of new listings was down 4% as compared to a year ago at $260,085. The level of new listings coming onto the market in July at 580 was up from prior month and up a significant 53% as compared to a year ago. This data indicates that the Manawatu / Wanganui region is a fairly balance market which is experiencing more activity than has been seen on recent years. Sales have been strong over the past 18 months whilst prices have been flat. The recent rise in inventory is ahead of sales and could potentially tip the balance in favours of buyers with a strong selection of property to choose from. 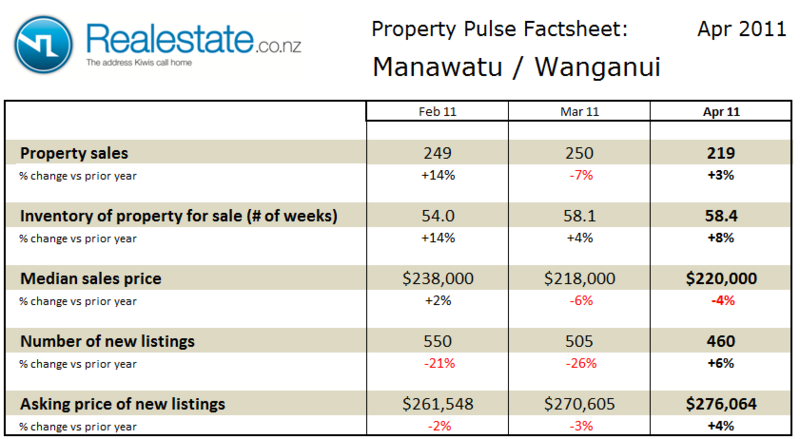 The Manawatu / Wanganui region property pulse factsheet for June 2012 is published using data from Realestate.co.nz and REINZ (Real Estate Institute of NZ). Property sales in the Manawatu and Wanganui region at 270 in the month eased very slightly on a seasonally adjusted basis in June, and was up 4% as compared to a year ago. The inventory of unsold houses on the market fell to 38 weeks reversing a rise seen in May, this now puts the level of unsold houses on the market below the long-term average of 41 weeks of equivalent sales. Median sales price of properties sold in the Manawatu and Wanganui regions at $226,050 was down 2% as compared to a year ago, and very slightly lower than the figure in May. The asking price expectation of new listings was up 5% as compared to a year ago at $274,731. The level of new listings coming onto the market in June at 578 was up from prior month and up a significant 54% as compared to a year ago. The Manawatu / Wanganui region property pulse factsheet for May 2012 is published using data from Realestate.co.nz and REINZ (Real Estate Institute of NZ). Property sales in the Manawatu and Wanganui region at 295 in the month rose on a seasonally adjusted basis in May, and were up 6% as compared to a year ago. The inventory of unsold houses on the market rose sharply to 45 weeks to juts rise above the long-term average of 41 weeks of equivalent sales. Median sales price of properties sold in the Manawatu and Wanganui regions at $228,000 was down just 1% as compared to a year ago, but up from the prior month. The asking price expectation of new listings was up 4% as compared to a year ago at $266,943. The level of new listings coming onto the market in May at 491 was up from prior month and up 27% as compared to a year ago. 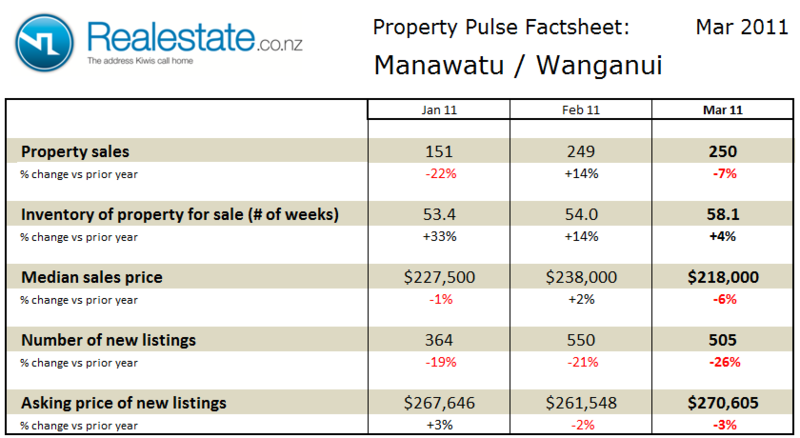 The Manawatu / Wanganui region property pulse factsheet for November 2011 is published using data from Realestate.co.nz and REINZ (Real Estate Institute of NZ). Property sales in the Manawatu and Wanganui region at 275 in the month rose on a seasonally adjusted basis in November, and was up 19% as compared to a year ago. The inventory of unsold houses on the market slipped to 38 weeks to remain below the long-term average of 40 weeks of equivalent sales. Median sales price of properties sold in the Manawatu and Wanganui regions at $230,000 was down just 1% as compared to a year ago, but up from the prior month. The asking price expectation of new listings was down 6% as compared to a year ago at $251,376. The level of new listings coming onto the market in November at 595 was up from prior month but down 6% as compared to a year ago. 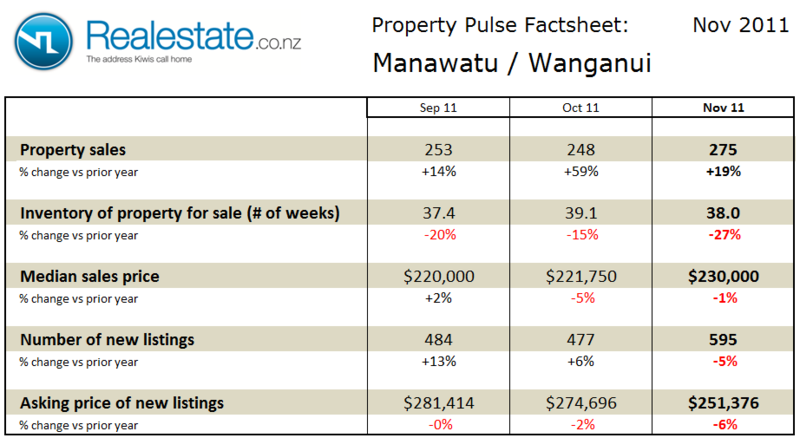 The Manawatu / Wanganui region property pulse factsheet for October 2011 is published using data from Realestate.co.nz and REINZ (Real Estate Institute of NZ). 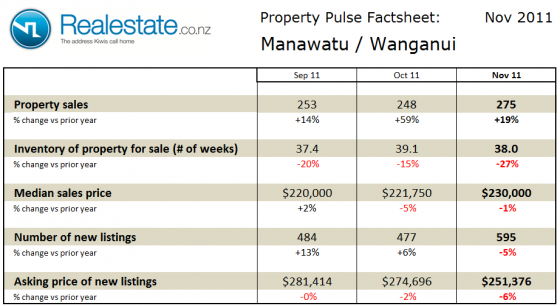 Property sales in the Manawatu and Wanganui region at 248 in the month fell on a seasonally adjusted basis in October, but was up a very significant 59% as compared to a year ago. The inventory of unsold houses on the market rose to 39 weeks to remain below the long-term average of 40 weeks of equivalent sales. Median sales price of properties sold in the Manawatu and Wanganui regions at $221,750 was down 5% as compared to a year ago, but up very slightly from the prior month. The asking price expectation of new listings was down 2% as compared to a year ago at $274,696. The level of new listings coming onto the market in October at 477 was down from prior month but up 6% as compared to a year ago. 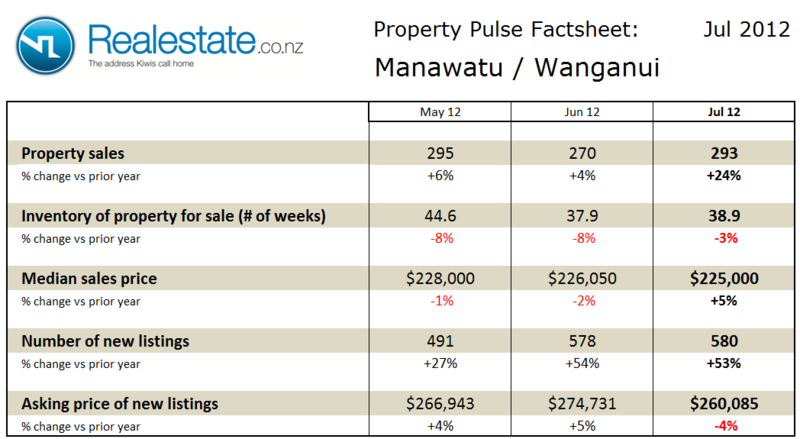 The Manawatu / Wanganui region property pulse factsheet for May 2011 is published using data from Realestate.co.nz and REINZ (Real Estate Institute of NZ). Property sales in the Manawatu and Wanganui region at 279 in the month rose significantly on a seasonally adjusted basis in May and were up 20% as compared to a year ago. The inventory of unsold houses on the market fell to 50 weeks to remain above the long-term average of 40 weeks of equivalent sales. Median sales price of properties sold in the Manawatu and Wanganui regions at $230,000 was up 2% as compared to a year ago and up from the prior month. The asking price expectation of new listings was down 6% as compared to a year ago at $248,755. The level of new listings coming onto the market in May at 388 was down from prior month and down 11% as compared to a year ago. 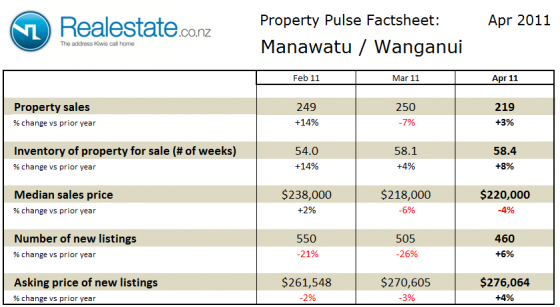 The Manawatu / Wanganui region property pulse factsheet for April 2011 is published using data from Realestate.co.nz and REINZ (Real Estate Institute of NZ). 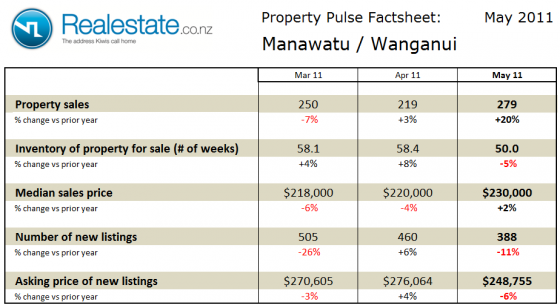 Property sales in the Manawatu and Wanganui region at 219 in the month rose slightly on a seasonally adjusted basis in April and were up 3% as compared to a year ago. The inventory of unsold houses on the market rose very slightly to 58.4 weeks to remain well above the long-term average of 40 weeks of equivalent sales. Median sales price of properties sold in the Manawatu and Wanganui regions at $220,000 was down 4% as compared to a year ago, but up slightly from the prior month. The asking price expectation of new listings was up 4% as compared to a year ago at $276,064. The level of new listings coming onto the market in April at 460 was down from prior month but up 6% as compared to a year ago. 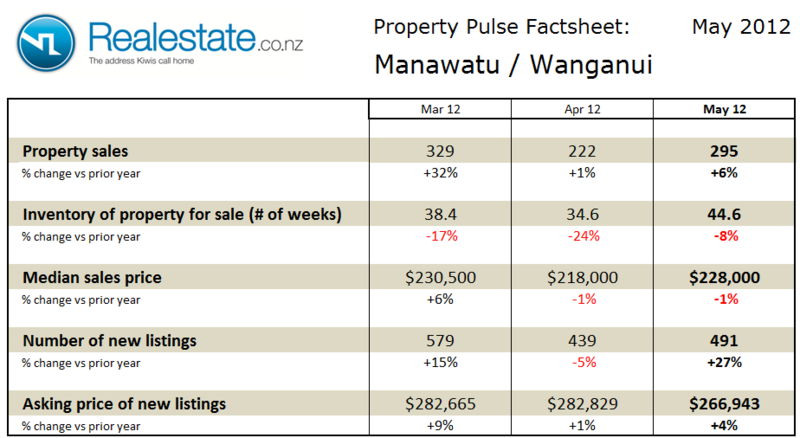 The Manawatu / Wanganui region Property Market factsheet for October 2010 can be downloaded by clicking this icon. 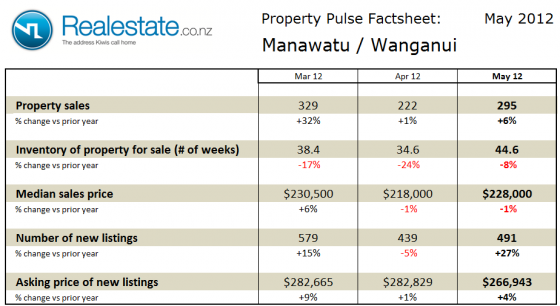 Property prices in the Manawatu / Wanganui region dipped in September to $216,500. As compared to a year ago prices in the region are down 3.9%. Property sales in the region rose again on a seasonally adjusted basis by 6.2%. A total of 240 properties were sold in September. Over the first 9 months of 2010 a total of 1,976 properties have been sold as compared to 2,666 in the same period of 2009. Inventory of houses on the market remained at 47 weeks of equivalent sales on the market as compared to 46 in August. The current inventory continues to be above the long term average of 36 weeks. This would indicate that the market still swings in favour of buyers. 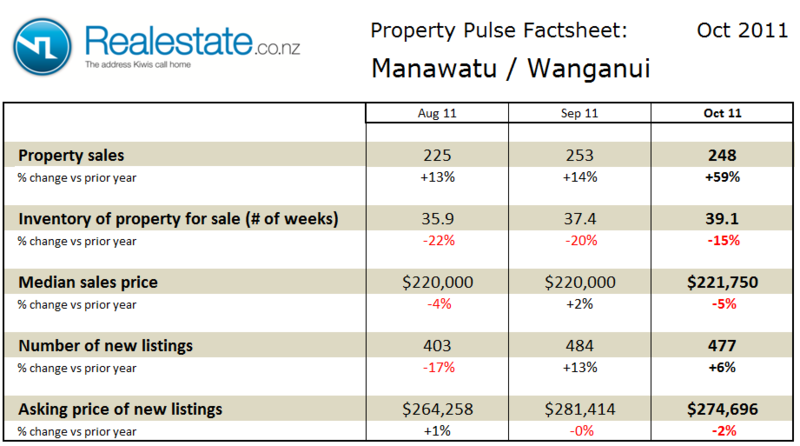 The Manawatu / Wanganui region Property Market factsheet for August 2010 can be downloaded by clicking this icon. Property prices in the Manawatu / Wanganui region rose in July to $232,000 from $219,000 in June. As compared to a year ago prices in the region are up 3.5%. Property sales in the region fell on a seasonally adjusted basis by 12.8%. A total of 207 properties were sold in July. On a moving annual total basis sales are down 8.8% with 2,920 properties sold in the past 12 months compared to 3,203 in the prior 12 month period. Inventory of houses on the market rose again to 51 weeks of equivalent sales on the market as compared to 47 in June. The current inventory continues to be above the long term average of 36 weeks. This would indicate that the market still swings in favour of buyers.